Heinzen Smith Properties builds unique custom homes in a Northern suburb of Chicago. 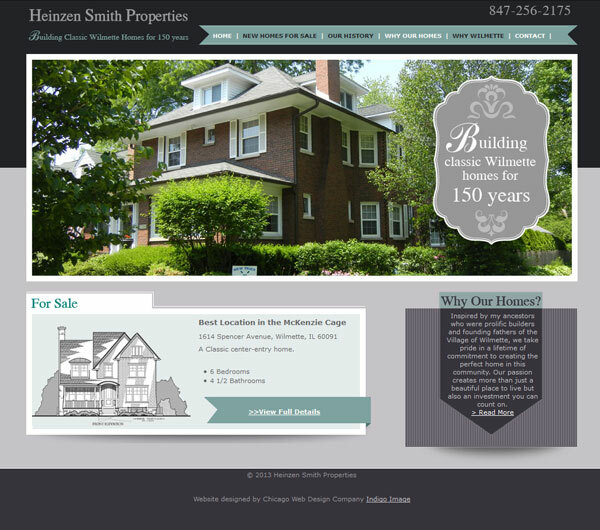 They wanted a site that captured their 150 year history and showcased new homes they are building. The color palette of this site was inspired by the patina of a slate roof common in many upscale Chicago neighborhoods. Using lots of fabulous client photographs we built a custom responsive website which showcases their new homes and building history and ensures the website performs to its optimum no matter what sort of device is used to view it. Read more about this project on our blog: The Chicago Web Designer and check out the signage we also created.